I was reading the Tamil magazine (Ananda Vikatan dated 30.01.05) in which there was an article about a diver named Kannan working in "Kutrallam" waterfalls. Presently he is engaged in rescuing people who had fallen in the deep waters, or recovering bodies from deep waters. In one of the experience he cites that he rescued a young boy by name Kalyana Sundram who had drowned in the deep water. His attempt to locate the boy deep in the water failed him for three days. When all hope of rescuing the boy became bleak and recovering of the body was also given up. On the fourth day when a final try was made, he could locate the boy in deep water. Alas that too alive! The boy Kalyana Sundram who was inside the deep water for three days rescued by Kannan is now married and living in USA. That reminded me of the yogic capacities of some of the siddha purushas of our Bharat varsha, especially the mystic incident that had taken place with Saint Shri Sadasiva Brahmendra. Sri Sadasiva Brahmendra was an avadhuta saint (meaning one who wanders naked) who practiced and preached advaita Vedanta. He is believed to have lived for more than two hundred years. He was disciple of 57th pontiff of the Kanchi Kamakoti Mutt, namely Sri Paramasivendra Saraswathi (1538 -1586). Ayyaval of Tiruvisanallur and Sadasiva Brahmendra had been schoolmates. It was Ayyaval who had introduced him to Sri Paramasivendra Saraswathi. He was very good in singing in praise of Lord. This intelligent youth used to argue and debate at the slightest provocation. One day his guru had asked him to be silent. He took that as 'jnana upadesa' and took to the vow of silence. His guru HH Sri Paramasivendra Saraswathi later conferred the title "Sadasiva Brahmendra" on him. There are many miracles performed by this mauna yogi, avadhuta purusha while wandering on the banks of Cauvery. The one I remembered when reading the above article, is what happened when Kodumudi river was flooded. It is said that while Shri Sadasiva Brahmendra was sitting on the bed of the Kodumudi river and penancing, the river was suddenly flooded. People saw water submerge him as he was still in his trance. He was given up as drowned. But three months later when the floods subsided he was still there in the same trance posture; he just rose up and walked away. He had been a part of the movement when Bhajana Sampradaya was crystallizing in south. He had left behind many valuable works on philosophy, kritis on many subjects and deities. Many musicians know him for his compositions of the kritis on advaita Vedanta, philosophy and deities. He is equally familiar to the devotees practicing the Bhajana Sampradaya. "Bhajare Gopalam" in raga Hindolam, "Bhajare Yadhunatham" in Peelu, "Pibare rama rasam" in Yamankalyani are some of the few enchanting kritis of His many other compositions. Today in many places of worship, Aradhana Utsavam of Saint Shri Sadasiva Brahmendra is celebrated by organizing musical performance by famed artist of the time. The famous among them is the musical festival performed in Tanjavur near The Prasanna Venkateswara Swami Shrine. The shrine has a four-pillared mantapam, a pavilion in which the Utsava Murthy is kept prior to hoisting it on to the chariot during the car festival. In early years, the floor of this pavilion had a hole in it, which could not be filled up despite many efforts. The bricks would simply fall through. It was this saint composer Sri Sadasiva Brahmendra who recommended a remedy for this. He prescribed installation of Sri Anjaneya in the spot. Under his instruction the installation was done and this great saint consecrated the idol. The Anjaneya temple is in the Sannathi Street of the Prasanna Venkateswara temple, and the street is buzzing with activity right from early morning. 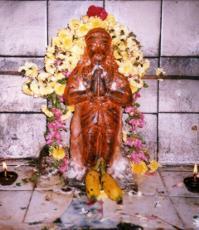 Sri Anjaneya Swami is placed in the small 'pirai' of the mantapam. You can see lot of people offering prayer as they walk pass the temple, even people from other sect and belief. Sri Anjaneya Swami installed by this great avadhuta saint who had practiced advaita philosophy is standing there with his hand folding blessing one and all. The temple attracts large number of people on Saturdays, Tuesdays and other festival days. The Lord Anjaneya of "nalu kal manpapam" near Sri Prasanna Venkateswara Swami Shrine in Tanjavur continues to be a protector of all faith and poor. Next time when you visit Tanjavur visit this temple and bring back peace and have your faith inspired by the Anjaneya consecrated by the great saint.